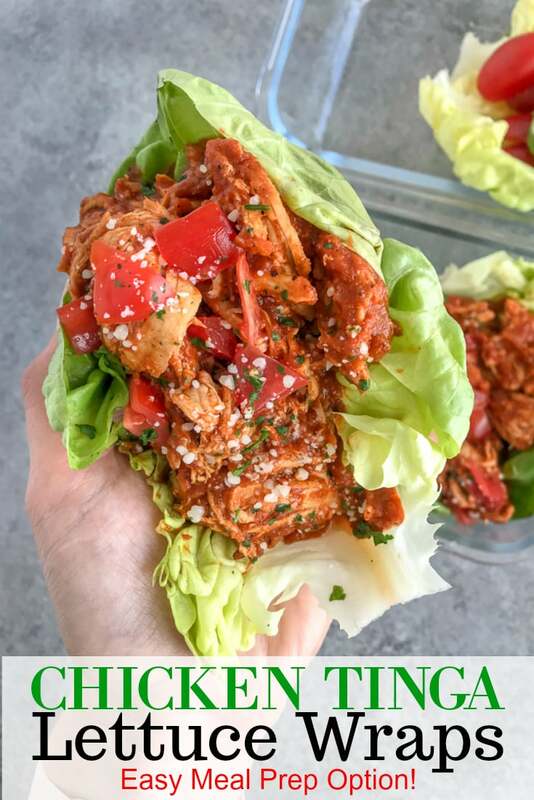 Easy to prepare Chicken Tinga Lettuce Wraps that are made with shredded chicken, fire roasted tomatoes, tomato sauce, salsa, and chipotles peppers in adobo. This recipe cooks in one pan quickly and easily. 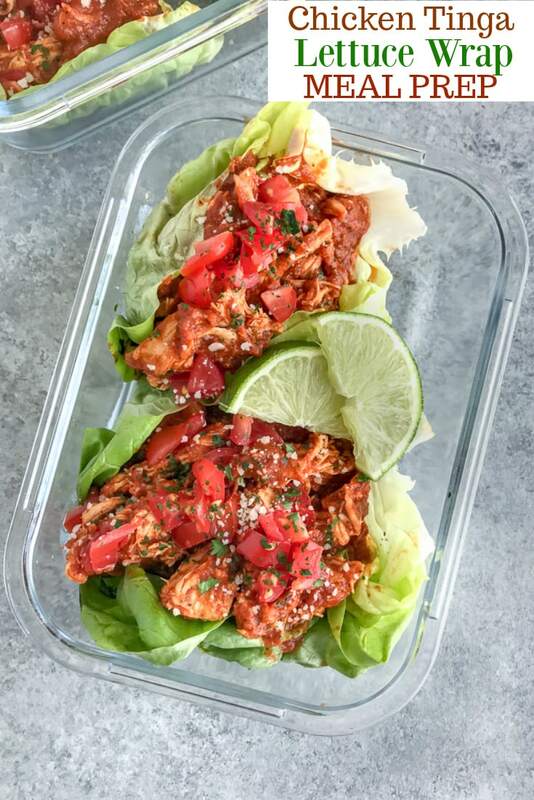 The sauce is full of bold, hearty flavor and is perfect for tostadas, tacos, over rice and beans, or in a lettuce wrap! Beware – it does pack a bit of heat! 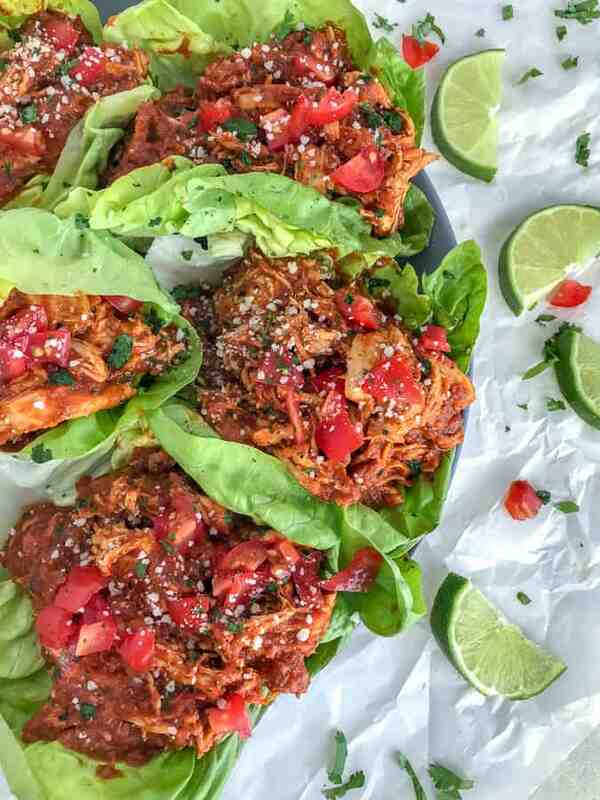 Perfect for meal prepping, your next Taco Tuesday, and freezer-friendly. High-protein, low-carb meal option. 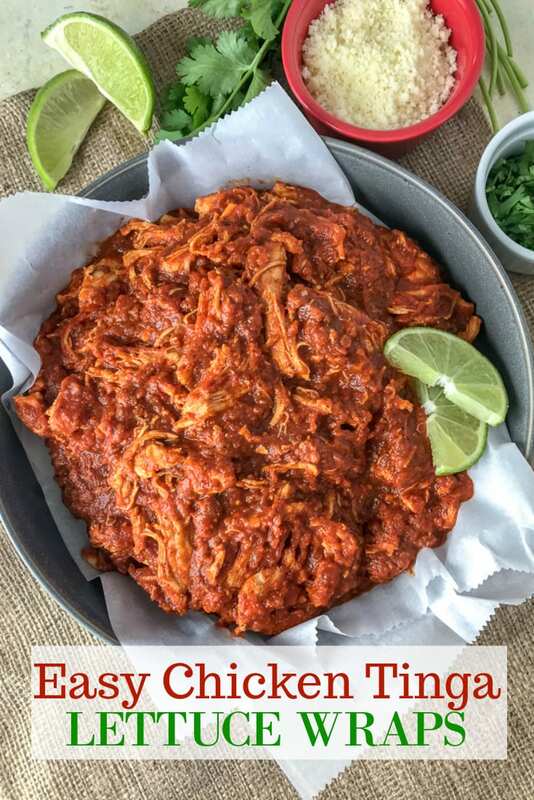 Chicken Tinga is a classic Mexican dish consisting of shredded chicken that is prepared with sliced, sautéed onions and cooked in a tomato-chipotle based sauce. The flavor is bold, smoky, and contains a little heat from the chipotle peppers. It is very easy to make and can be ready in around 30 minutes! This recipe uses pre-cooked shredded chicken, which helps cut back on the time. But you are more than welcome to slow-cook the chicken in the sauce, remove, shred and add it back! 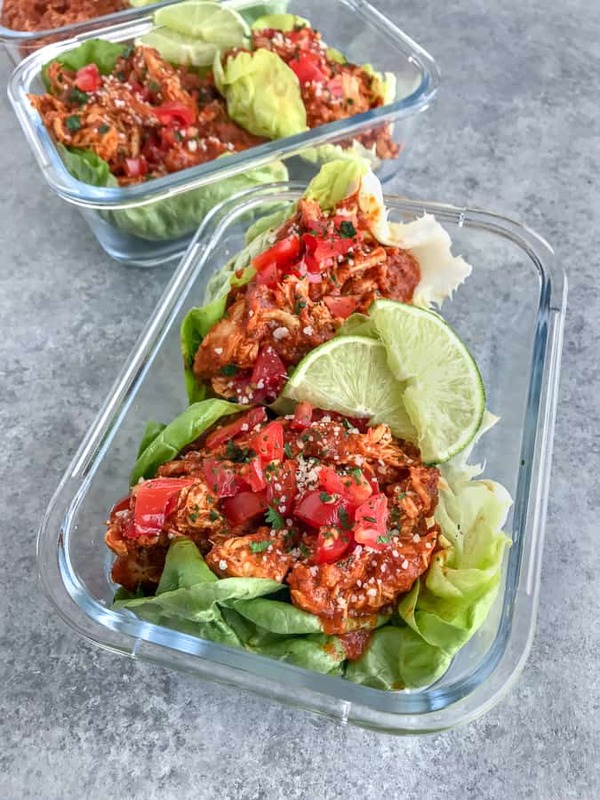 It is traditionally served in corn tortillas, in burrito bowls, or with tostadas, but we used them in salad bowls and lettuce wraps — to keep this a high-protein, low-carb option. It also helps to keep the calories down, as well! Sauté the onions in a large non-stick sauce pan. Once translucent, add the minced garlic and cook 30-60 seconds. Add the chipotle peppers and seasonings, stirring for 1 minute. Pour in the tomato sauce, fire roasted diced tomatoes, and salsa. Stir to combine and consistently stir every minute or so while the sauce simmers for 5 minutes. Safely pour the sauce into a blender or food processor. Blend until smooth. Pour the sauce back into the pan, combine with the cooked, shredded chicken and cook 2-3 minutes to warm. Serve over rice and beans, in corn tortillas, over a tostada, or in lettuce wraps. Garnish with grated cotija cheese, cilantro, diced tomatoes and a fresh squeeze of lime juice. CHICKEN: Use pre-cooked, shredded (or diced) chicken. Rotisserie chicken works deliciously! If you don’t have either available, use 1 1/2 pounds of whole chicken breast added after the onions have cooked down. Cook 2-3 minutes per side. Process the tomato sauce, chipotles, tomatoes, and salsa in a food processor or blender, then add it to the pan, covering the chicken. Add in the seasonings and allow to simmer 20-25 minutes, or until the chicken has been cooked through. The internal temperature should read 165 degrees F using a meat thermometer. Remove the chicken and shred it with two forks and return it to the pan to simmer 2-3 minutes. CROCKPOT: Process the tomato sauce, tomatoes, chipotles, and salsa in a food processor or blender until smooth. Add seasonings and stir. Place the uncooked chicken breast into the crockpot and pour the sauce over to cover. Cook on LOW for 6 hours or HIGH for 4 hours. When done, remove the chicken to shred with two forks. Return it to the sauce and stir to fully combine. CHIPOTLE PEPPERS: This dish comes with a bit of heat! Adding 2 chipotles will give it a bit of a bite (low heat in my opinion) and 4 chipotles will give it a some true heat. Not a heat that will build and burn your mouth. I’m not a fan of that. So add peppers according to your taste preference! SODIUM: As always, I use low-sodium or no-salt-added canned goods when I can. You can use regular or choice. Season with salt to your preferred taste. STORING: This can be stored in the fridge in an airtight container for 4-5 days. Or in the freezer in a freezer bag or storage container for up to 3 months. 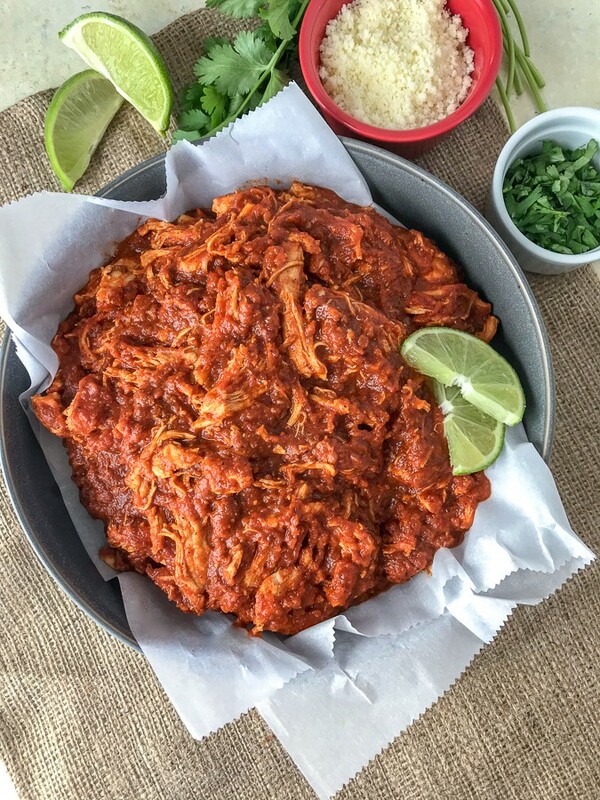 If meal prepping with leaves of lettuce, I would keep the Chicken Tinga separate from the vegetables in order to reheat the meat. Looking for re-useable, glass meal prep containers? I recommend single compartment containers or three-compartment bento-style box containers. For sauces, herbs, dips, cheeses, etc – I recommend using these dressing containers. They work well for travel, are dishwasher safe, and great for portion controlling cheese and dressings! Reheat, covered with a napkin or paper towel to prevent any microwave mess. Hamilton Beach 12-Cup Stack and Snap Food Processor and Vegetable Chopper – to puree the sauce. Five Blade Herb Scissors – the best thing since sliced bread! Cuts herbs like a dream. Digital Meat Thermometer – quick and easy to use! 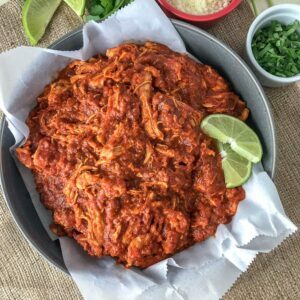 A traditional Mexican dish full of bold, hearty flavor that comes together effortlessly and quickly! Great over a bed of rice and beans, on a tostada, or in a lettuce wrap! 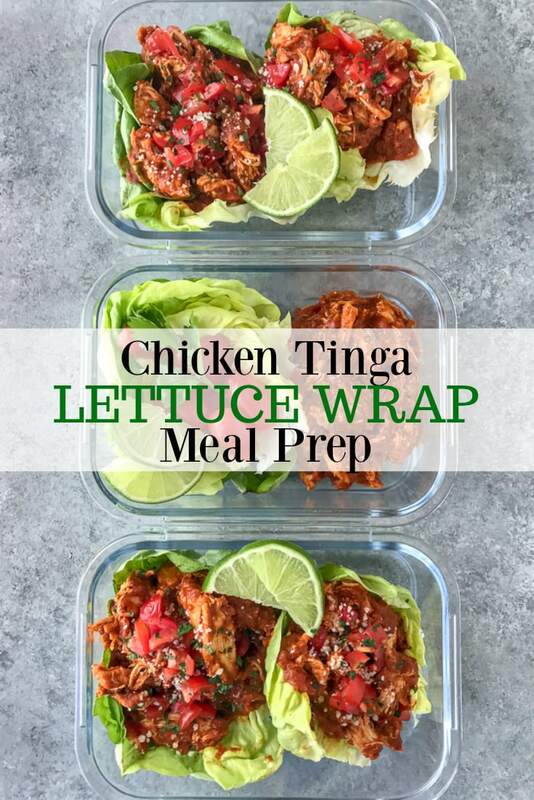 Perfect for meal prep or as a low-carb, high-protein meal option. Place a large nonstick sauce pan over medium heat with oil. Once the pan and oil are heated, add the onion and cook 3-4 minutes. Or until translucent. Add the minced garlic and cook 30-60 seconds, stirring. Add chopped chipotles (with adobo sauce) and seasonings. Stir and cook 1 minute. Pour in the tomato sauce, fire roasted tomatoes, and salsa. Allow to simmer 5 minutes. Stirring frequently. Remove from heat and carefully pour into a blender or food processor. Process until smooth. Pour the sauce back into the pan, add the cooked, shredded chicken and stir. Simmer 2-3 more minutes. Season with salt and pepper, to taste. Serve hot with rice and beans, tostadas, in corn tortillas, or lettuce leaves. Garnish with freshly chopped cilantro, diced tomatoes, and cotija cheese. 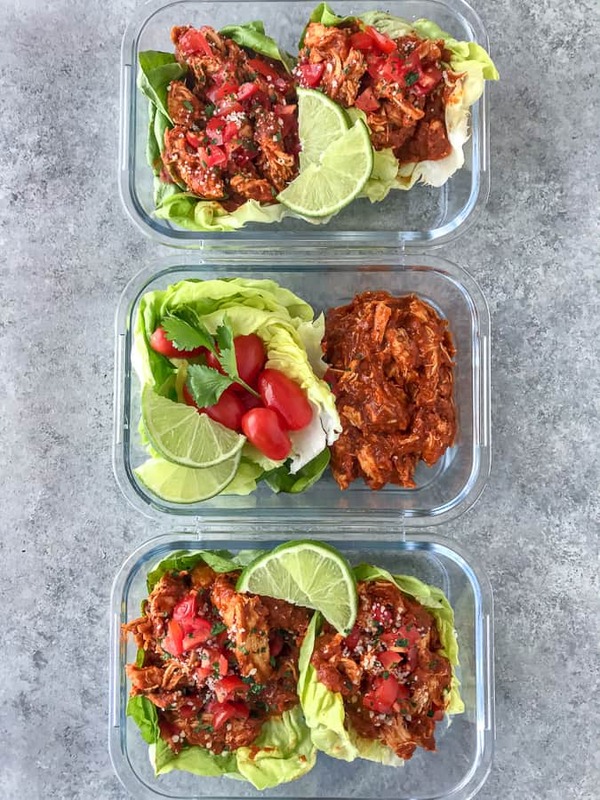 Divide the Chicken Tinga between four meal prep containers. Separate the lettuce and lime wedges into a separate container or into four sandwich bags - each with a paper towel inside. This will help absorb moisture as the lettuce sits. 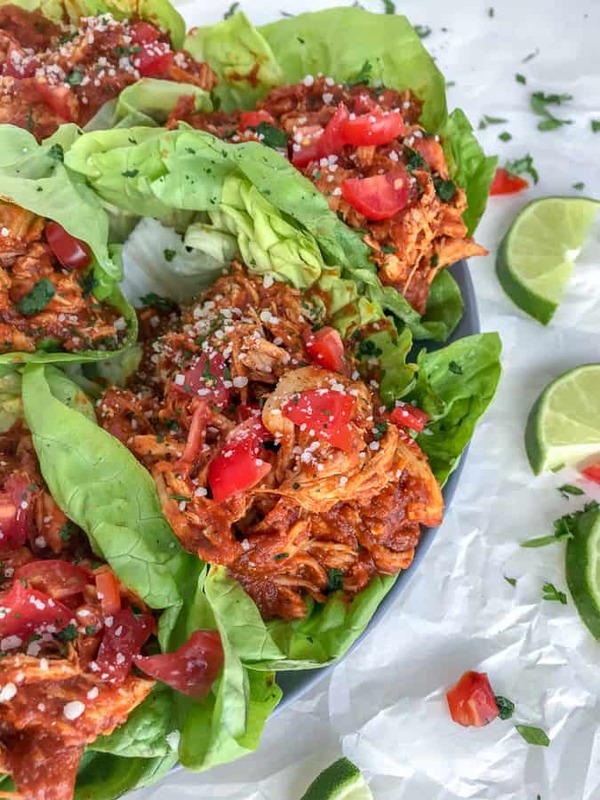 If easier, garnish the Chicken Tinga with the cilantro or place it, as well as the cotija cheese, into four separate dressing containers. Store meal prep in the fridge until ready to eat. CHICKEN: Use pre-cooked, shredded (or diced) chicken. Rotisserie chicken works deliciously! If you don't have either available, use 1 1/2 pounds of whole chicken breast added after the onions have cooked down. Cook 2-3 minutes per side. Process the tomato sauce, chipotles, tomatoes, and salsa in a food processor or blender, then add it to the pan, covering the chicken. Add in the seasonings and allow to simmer 20-25 minutes, or until the chicken has been cooked through. The internal temperature should read 165 degrees F using a meat thermometer. Remove the chicken and shred it with two forks and return it to the pan to simmer 2-3 minutes. CHIPOTLE PEPPERS: This dish comes with a bit of heat! Adding 2 chipotles will give it a bit of a bite (low heat in my opinion) and 4 chipotles will give it a some true heat. Not a heat that will build and burn your mouth. I'm not a fan of that. So add peppers according to your taste preference!